Ok, we all know that SNEAK mounts in taxidermy today remind you of a “TORPEDO”! Well, this NEW OFFSET SNEAK changes all that!This NEW BOSS OFFSET SNEAK presents a sneak pose in a NEW way that is ABSOLUTELY BEAUTIFUL!! 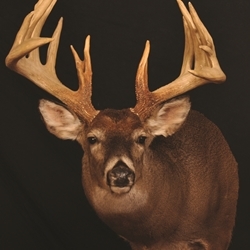 This is Dan’s favorite pose of all his NEW BOSS whitetail sculptures. Dan states “I was truly amazed when I mounted a hide on this OFFSET SNEAK. I never expected this SNEAK pose to be my favorite – but it is! I know you’re gonna LOVE IT!"